I'm writing this from Puerto Escondido where I've just finished doing one of my favorite things...watching the sun come up and light up the Sierra de la Giganta mountains that tower above this section of coast. The mountains are very red in color and the warm morning sunlight just makes them glow. They're 4700' high right here and their peaks just a few miles from the coast, so you can imagine how steep they are. In the photo to the right, which was taken from Isla Dazante, Puerto Escondido is hidden behind the cliffs on the right hand side. It's also wonderful to watch the wildlife start their day. This morning we had sea rays jumping repeatedly out of the water and landing flat, making loud slapping noises. When the sun first rises, large numbers of Frigate birds ride the thermals above the peaks along the coast and there's a constant parade of flocks of pelicans doing a dance where the line of birds all stop flapping at the same time and this ribbon of birds make a graceful pass close to the water and then back up again. When I last wrote we were at Isla Coronados and were headed to the N end of Isla Carmen to spend some time at two anchorages that we had never visited before. The rock formations are wonderful and the color is amazing with an incredible variety of red, green, yellow and gold colored rocks all mixed together. 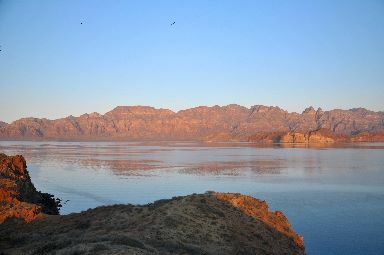 To emphasize this, the point to the west of our first anchorage is named Punta Tintorera. The first anchorage that we pulled into is named Puerto de la Launcha was once used by launches to pick up laborers who worked at the salt ponds at Bahia Salinas. The anchorage is open to the N and everything was fine until about 1:15 AM when a NE swell appeared and we were rolling side to side. Sue rescued a watermelon which had escaped and was rolling around and I put out a stern anchor to keep us pointed into the swell. The next morning we decided to move east to V-Cove which seemed to provide better protection. 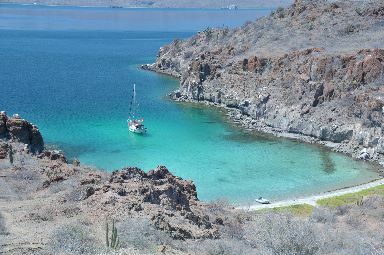 V-Cove (aka El Refugio), shown above, is a narrow cliff-lined anchorage which can handle 2 mid-sized boats. The white cliffs have been eroded by millennia of wave action and havelots of overhangs and sea-caves. Some of these sea caves are large enough to drive your dinghy into and turn around. What I found really cool was snorkeling in these caves and going in much further than you could take a dinghy. In some caves the overhang came right down to the water forming an inner chamber with an air pocket that you can swim in to. When surge comes in, the air gets forced out making the chambers "breath", sometimes with huge gusts of air. 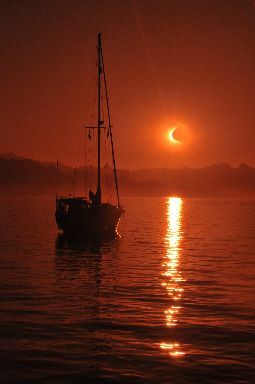 Unfortunately a NW swell developed and that swell combined with the NE swell, turned V-cove into a washing machine, so we pulled up the hook and headed to Bahia Marquer on the S end of Isla Carmen where we would have a good view of the partial solar eclipse. We weren't disappointed and got a spectacular view as the sun descended over the Sierra de la Giganta. 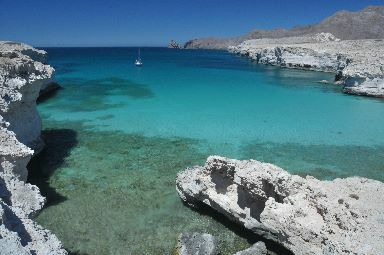 From there we headed to Honeymoon Cove on Isla Danzante. These are a series of three small coves that can fit 1 or maybe 2 boats at most. The smallest of the anchorages (shown below) requires a stern anchor to keep you from swinging into rocks, so we decided not to take that one as we wanted to swing with the breeze in an attempt to keep cool. Instead we picked the southern anchorage which was just delightful and gave us plenty of swing room. Isla Danzante is very rugged and steep-to, so there's nothing on the island. We went to the S end so that I could dive on the reef, but the current was too swift and the visibility wasn't very good, so we ended up just snorkeling in sheltered areas. What was quite surprising was that the water flowing on the E side was significantly colder than the water on the W side, which made snorkeling where they mixed an interesting thermal experience. We then headed to Puerto Escondido to do laundry and get Internet. From here we'll move S a few miles and enjoy the resort at Bahia Candeleros that welcomes cruisers. At Puerto de la Launcha we anchored in about 18' at N26-03.25 W111-06.204. I dove the point to the NNW of the anchorage and had an OK dive. The most interesting terrain was right at the point where there were lots of steep walls and cracks on individual rock spires. If you go west, it flattens out into a boulder field, but then you run into large rock spires with nice walls. At V-Cove (N26-03.5 W111-05.094) we anchored in about 25' over sand with excellent holding. I had a very hard time getting the stern anchor out with the dinghy motor. 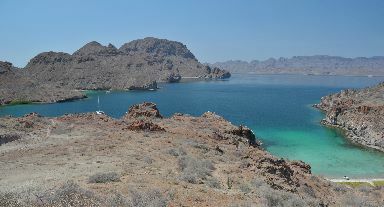 Bahia Marquer is located at N25-51.99 W111-13.24 and we anchored in about 17' over sand. According to someone who I was just talking to, there's supposed to be a 100' vertical wall for diving there. I wish that I knew about this before going there! The 3 anchorages at Honeymoon Cove (left and above) are located around N25-48.52 W111-15.46. From the above photo, you can easily see where to drop the anchor in the small W lobe. For the middle lobe, anchor in about 35' and split the anchorage into 3rds if you don't mind company. We anchored in about 17' over sand in the southern lobe.